RACE DAY IS ON APRIL 14, 2019! 10K route is a beautiful scenic course which begins in Vancouver’s downtown core at Burrard Street and Georgia Street. 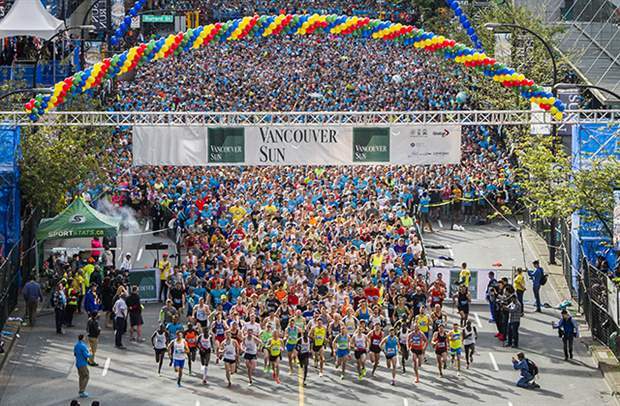 Participants will enjoy the downhill start as they make their way towards the world famous Stanley Park, continuing along English Bay to Hornby Street, then onto Pacific Avenue, across the Burrard Street bridge exiting onto 2nd Avenue. Winding along Fir Street to join 4th Avenue the route continues east on 6th Avenue to the Cambie Street Bridge for the final stretch across the bridge to the finish line.The course truly showcases all the beauty of this wonderful city. As typical of other road races, the roads used are completely closed to vehicular traffic and streams of observers watch and cheer from the along the sidewalks. To see the 10K course map, click here. Your Vancouver Sun Run experience does not end just outside our host venue, BC Place Stadium; you are encouraged to enter the stadium to enjoy the wrap party along with your family and friends. At the wrap party, celebrate your achievement with live entertainment, check out the Kids’ Zone, watch the awards’ ceremony for the top finishers and enjoy free fruit, bagels and refreshments provided by our generous sponsors. Water stations are provided at numerous locations along the course as well as music entertainment in the form of bands. Only runners, joggers, walkers and wheelchairs are permitted. Dogs, skateboards, wagons, in-line skates, scooters, roller skis, bicycles and vehicles are strictly prohibited. Participants with these items will be removed from the course and will be disqualified. For safety purposes, participants with walking poles, strollers, baby joggers or recreational wheelchairs MUST start in the 1:46 min+ zone at the back of the pack and must walk the route. You must accept the risks of participating in a race with over 40,000 entrants. Please read the release and waiver carefully before entering. Tens of thousands of racers take part in the Sun Run. All participants must provide an estimated finish time on their entry forms. Entrants of similar ability are grouped in time zones and start the race in a series of short timed intervals. If no estimated finish time is provided, you will be assigned a 1:46+ minute bib for the Walker’s Division. To run or walk in the same time zone as your friends, family or team members, you must select the same estimated finish time on all the entry forms. If you are at different ability levels, you must choose the zone that’s suitable for the slowest participant. 0:00 – 0:44:00 SEEDED (0:38:00 Men / 0:44:00 Women), application times are verified. 1:45+ Walkers, entrants with walking poles, baby joggers, strollers and non-competitive wheelchairs must start here. Awards are given three deep to males and females in: Overall, Masters, Wheelchairs, 16-18, 19-24, 25-29, 30-34, 35-39, 40-44, 45-49, 50-54, 55-59, 60-64, 65-69, 70-74, 75-79, 80-84, 85-89, 90-94, 95 plus. No award category for 15 and under.